J.S. Howard offers all Commercial, Residential, and Industrial electric services such as Lighting, Wiring, Data Networking, Generator Services, and any other general electrical maintenance, repairs, and upgrades. 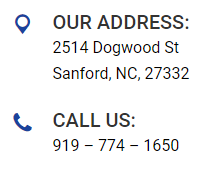 Please don’t hesitate to give us a call, shoot us an email, or fill out our contact form and someone will give you a call shortly!